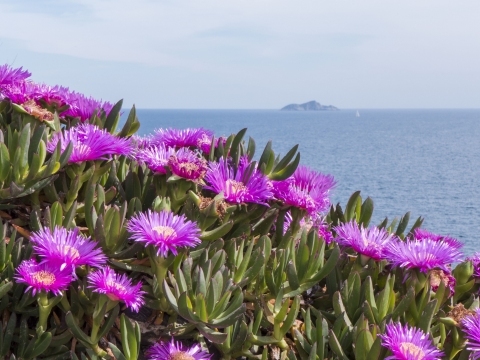 Hottentot fig is a low-growing, evergreen, succulent perennial plant, forming a dense mat that completely covers the soil. The plant is sometimes harvested from the wild for its edible fruit and it is also cultivated both as an ornamental and for its ability to stabilize sandy soils. S. Africa - Cape Province. Plants succeed in the drier parts of the tropics and subtropics, and also in the warmer parts of the temperate zone. They are not very cold tolerant resistant and can be killed by temperatures below about -2°c. van Wyk B.; van Oudtshoorn B.; Gericke N.
Briza Publications; Pretoria, S. Africa. An excellent guide, containing information on over 130 medicinal herbs of S. Africa. It gives a reasonable description of each plant, with excellent photos and details of medicinal uses and active ingredients. ]. Tannins are probably responsible for many of the beneficial properties.